Wait, where are the marbles? When I first heard the name of this technique ("Mantra Marbles"), I thought: cool, marbles! What are we going to do with them? I had visions of dropping them into the pot, or rolling them around in mica oils or something. It turns out this is a linear mantra swirl with a catchier name, and it is pretty cool! BTW, it took all my willpower not to make the speckles! I created a palette somewhat similar to my Spring Wreath soap, as it's one of my favorite color combinations. The color sequence is: pale pink - dark green - light green - pale pink - dark pink - bright pink - dark pink - pale pink - light green - dark green + the plain side of pale pink. I was very happy that this soap took third place, as I there were so many pretty soaps and I didn't expect it! 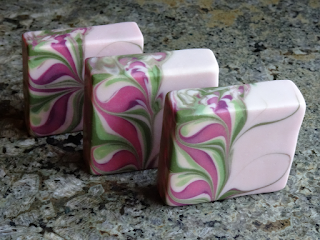 Beautiful soap, the colors match perfectly! So sorry to make you twitchy!! I really like the effect! Beautiful colors & swirls - definitely matches your theme! 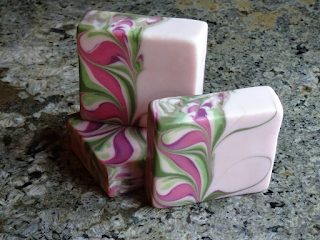 LOVED seeing your inspiration - what a great addition to your soap story! Lovely, lovely soap and the "soft" focus is fine! Kept coming back to this soap, clicking on your blog at least six times. Very beautiful! Love your soap. You nailed the colors of the lily. Thanks for sharing your recipe (we'll file it away!). Great job! This is so beautiful Claudia! 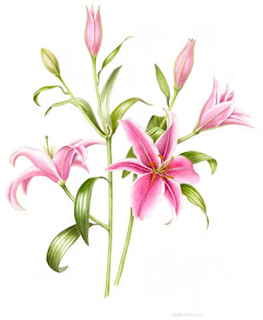 The lily is so well represented in your beautiful swirls. Gorgeous, Claudia! I always love your soaps!!! Thanks, Janelle, but I was really rooting for yours to win! Il est très beau. Lovely soap. Gorgeous as always, Claudia, and congrats on another win! Claudia, this is annoter beautiful soap, and you well deserved the ranking! Well done! I really liked your soap, its super! But I had difficulty understanding, the technique of the colors, I mean how you poured them in the mold.Is there a turorial for this one? Thanks for the entertaining post and sharing your beautiful soap! Hello !! We are a cosmetics company called ZINEGLOB and also wa are proud to informe you that we have clients spread all across the word like Europn and USA. We provide hight Quality products made from premium raw materials sourced locally and aroud the world, the ingridiants which includes Argan Oil, Prickly pear, and rose water.